Home / Avenoc Suppositories 10 supp. 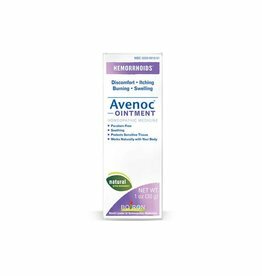 Avenoc® Suppositories combines homeopathic medicines traditionally used to treat hemorrhoids with the soothing effect of cocoa butter*. Temporarily relieves minor symptoms of hemorrhoids such as soreness, itching and burning*. When practical, cleanse the affected area with mild soap and warm water and rinse thoroughly. Insert suppository rectally morning and night. Children under 12 years: ask a doctor. Do not use if blister seal is broken. Ask a doctor before use in case of bleeding. When using this product, do not exceed recommended daily dosage unless directed by a doctor. Stop use and ask a doctor if symptoms persist continuously for more than 7 days or worsen. If pregnant or breast-feeding, ask a health care professional before use. Combines homeopathic medicines traditionally used to treat hemorrhoids and provide relief from soreness, itching, and burning*.